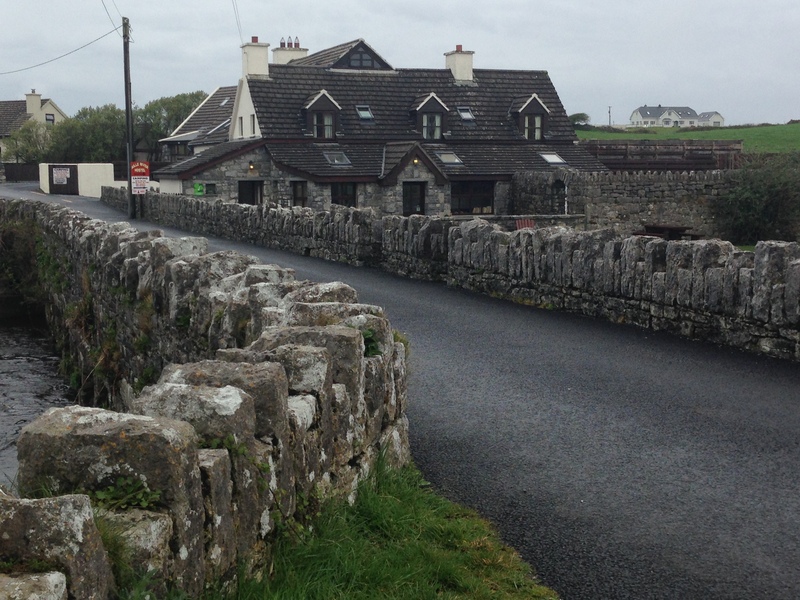 The little town of Doolin was one of my favorite spots in Ireland. I’m not sure what took it to that level of favorites, but it might have been because I spent a day there on down time. I wrote in my journal, took a long walk, got some pictures and sat in a little bake shop eating a brownie and visiting with some locals. 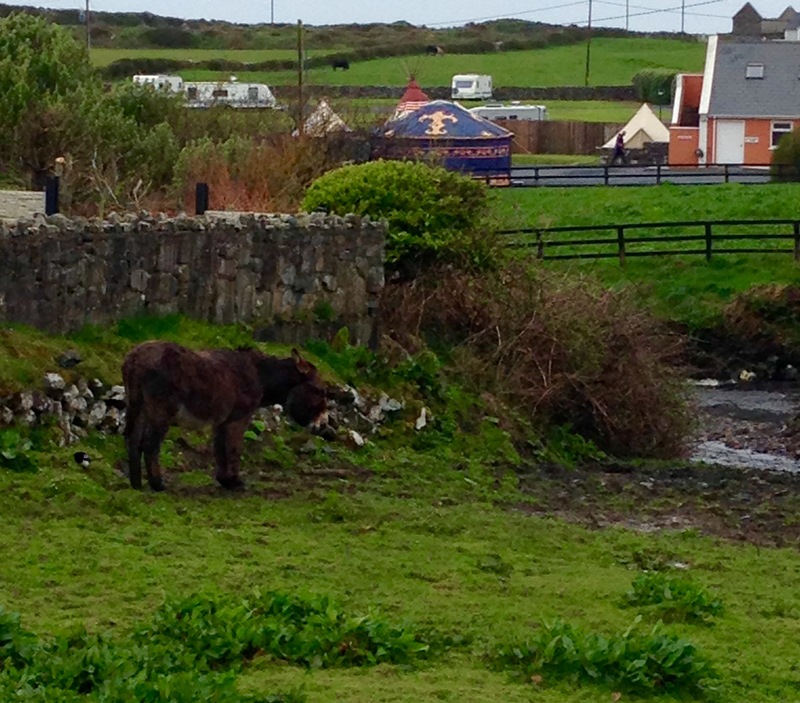 That morning it was raining in Doolin, and it was windy. 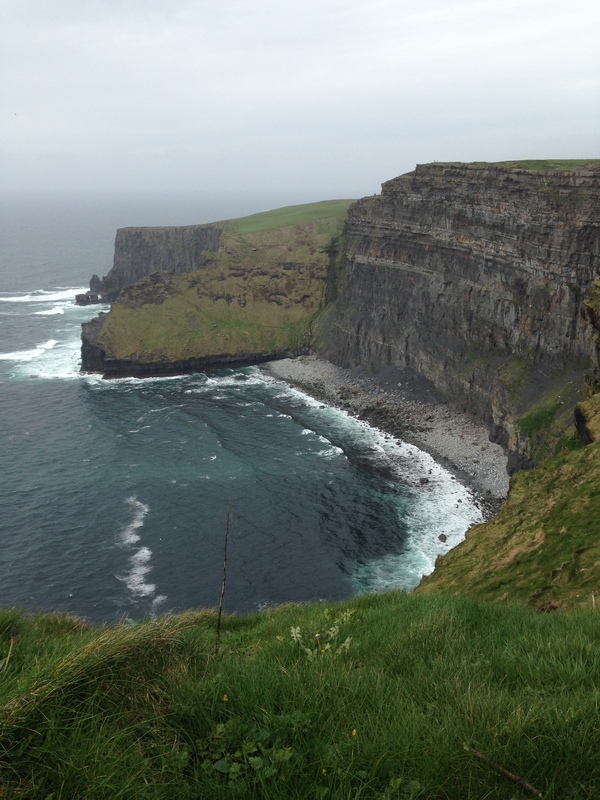 The original plan for the day was to take a boat ride to one of the Aran Islands, and get a view of the Cliffs of Moher from the bottom looking up on the way back. It sounded fun during the planning, but today I just could not manage an open boat ride on a rainy, windy day. The others wanted to go and I sent them on their way with my blessing. I found myself a warm comfy chair and caught up with my journal at about 11:30. After a big stretch I was ready to explore the town to see what it had to offer in the way of pictures. The rain had stopped. 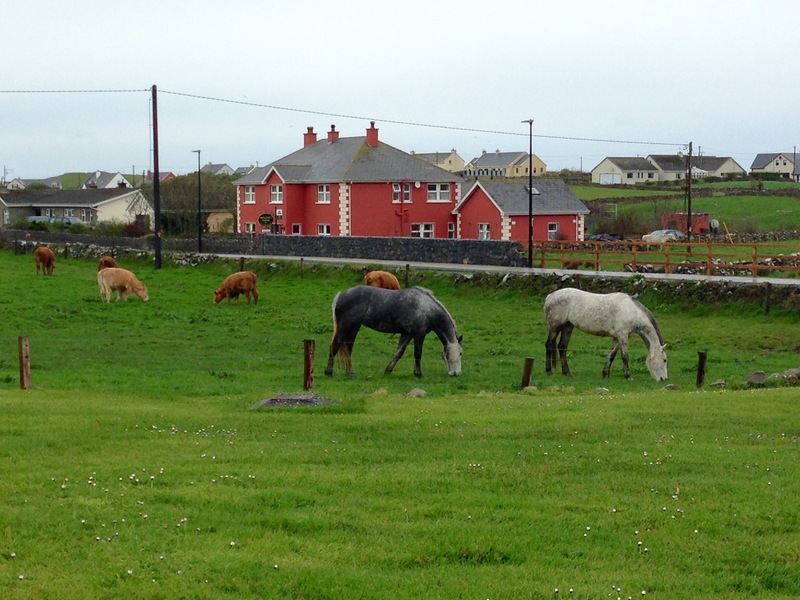 This is what greeted me as I stepped out from our bed and breakfast complex. Next came stone walls and my donkey friend. By the time I got into town, my phone had lost it’s charge from all the texting I did to family back home. This, of course happened without my notice. So I went into a little bakery and spied some brownies. I began talking to the gal behind the counter and mentioned that I had been out walking and my phone was dead. She said “sit down and enjoy your brownie, I will charge it in the office, we have a cord.” While sitting she gave me an Irish newspaper and a glass of water. That is how I spent the next half hour, phone charged to a decent level, caught up on the news of the day and I was back on the beat looking for photo opts. They were on every corner. 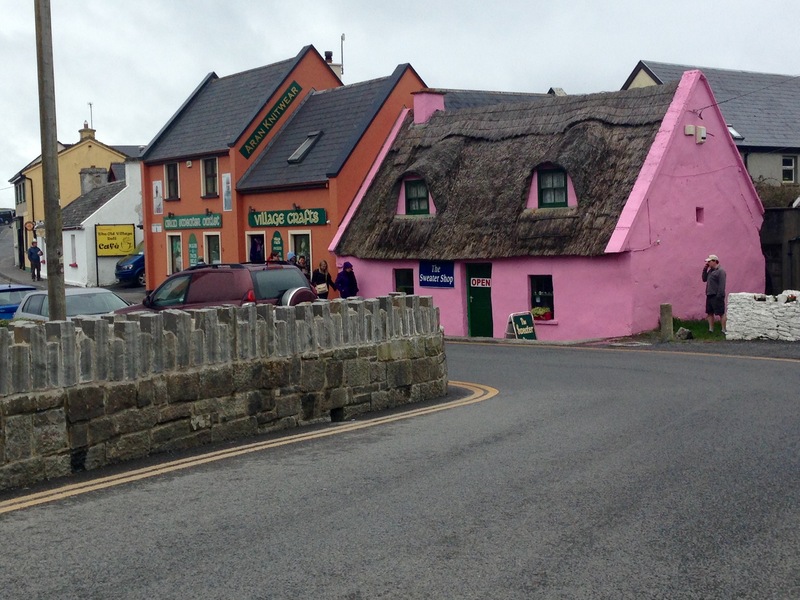 I loved this little pink house with a thatched roof from a distance, and was excited to find out that it was a shop and I could actually go inside and have a look around. It kind of looked like a doll house to me, very cute inside as well. 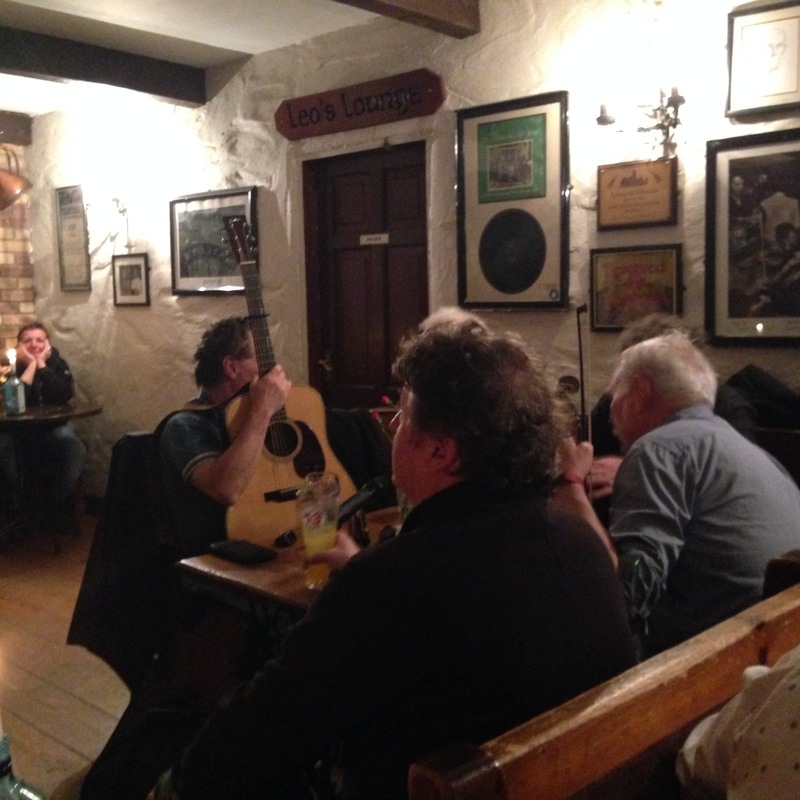 That evening, we enjoyed dinner and music at O’Conners famous pub. The food was fabulous and the music, hand clapping fun. The next day we had to leave Doolin, but not before I got a picture of this artists interpretation of a famous ancient burial ground that was hanging in the hallway of our b&b. 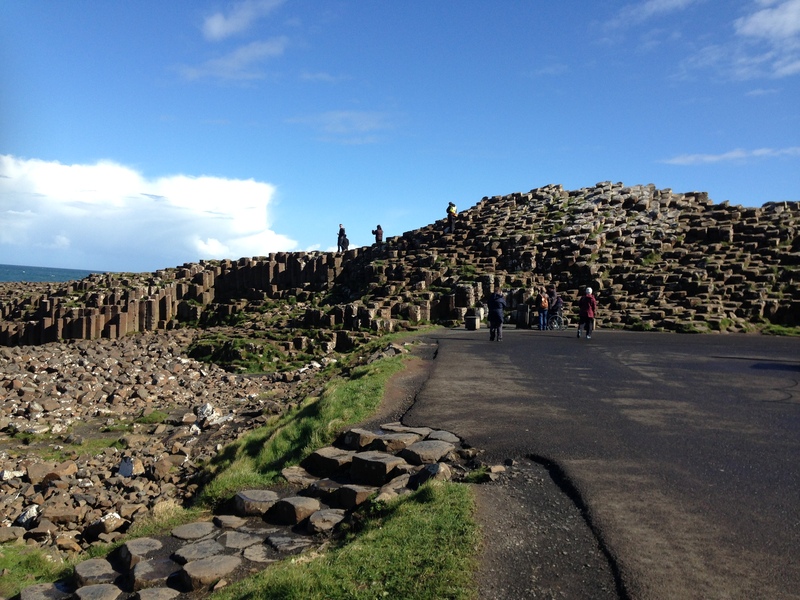 We had seen it in our travel brochures and now wanted to see the real thing. 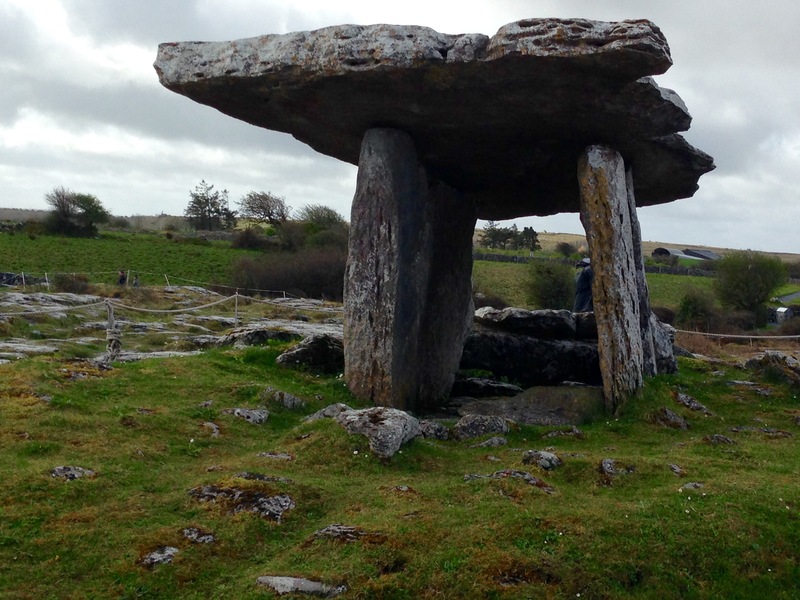 The Poulnabrone dolmen is a precarious set up of large stones, and offers many different photo options. 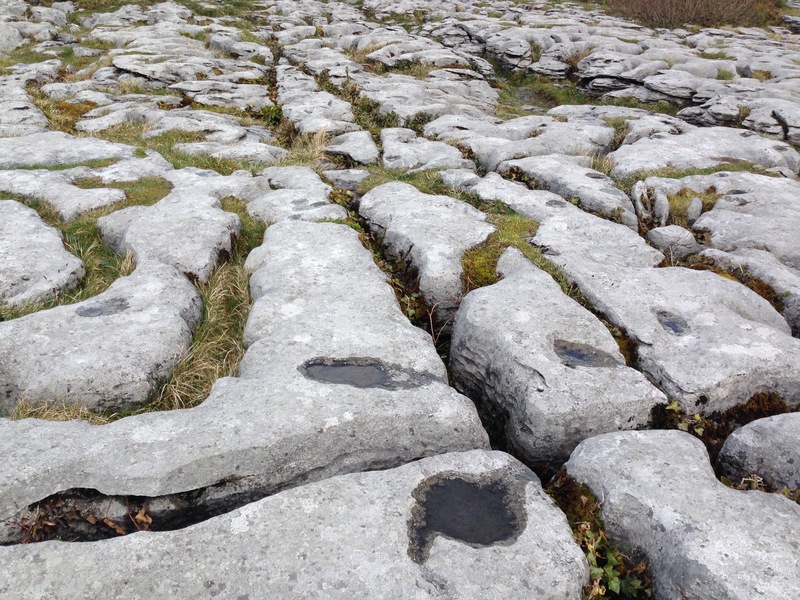 It is located in the Burren National park. For someone with a photographer’s eye, it is a work of art, standing thus for thousands of years. This was my best shot. 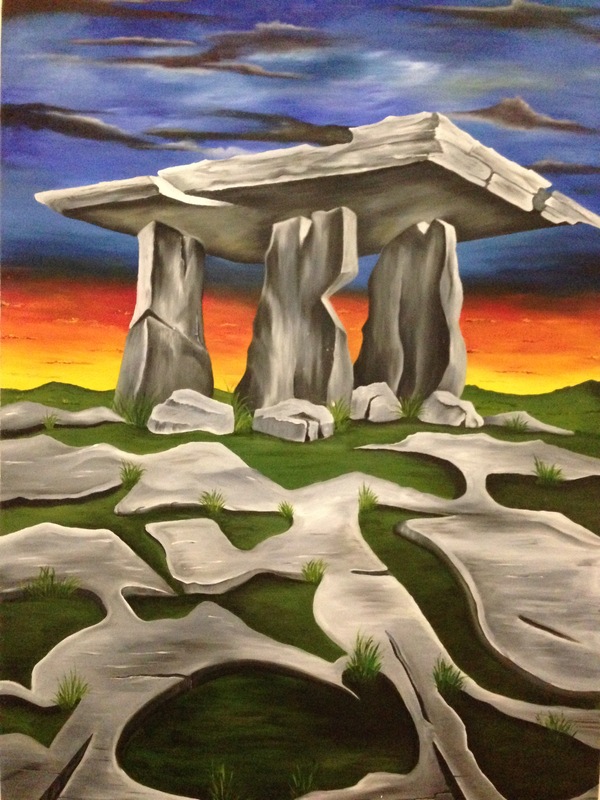 These are the stones that surround the site, making the eerie looking patterns on the painting. We met a young man in town who told us he had never been out of Doolin, even though it was a favorite, I had no problem moving on. I hope some day he will get to move on as well. 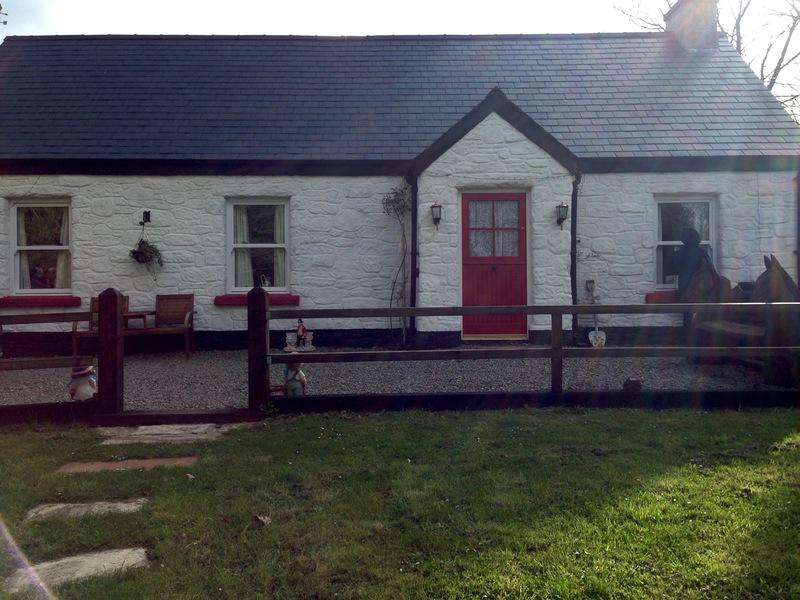 Leaving Doolin was saying goodbye to a fast made friend, only to find new places and things to see in a whole different country, Northern Ireland! Join me there next time. I was told the boat ride was wet and rocky. Glad I stayed behind and made a friend. 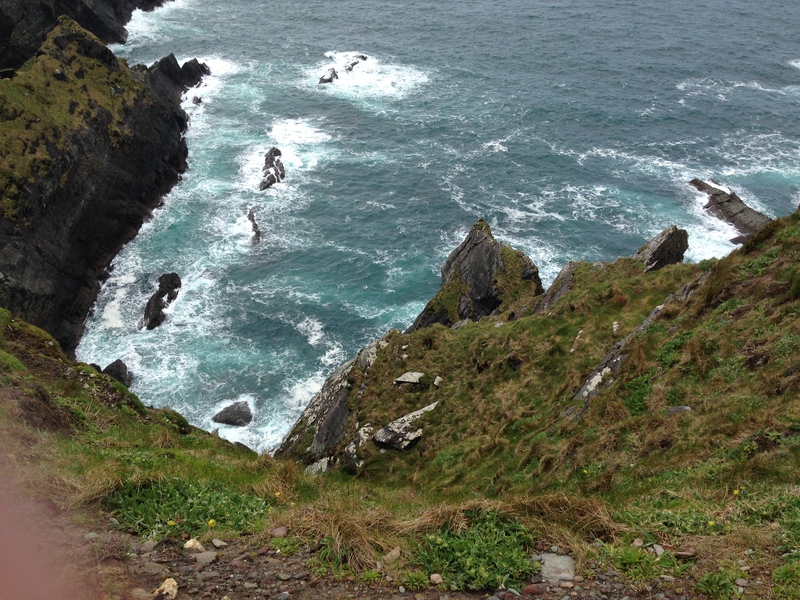 The Ring of Kerry is one of the most popular tourist sites on the coast of Ireland. We started out early on an April Sunday morning to have our go at it. Traffic was almost nil, we had the road to ourselves much of the time. 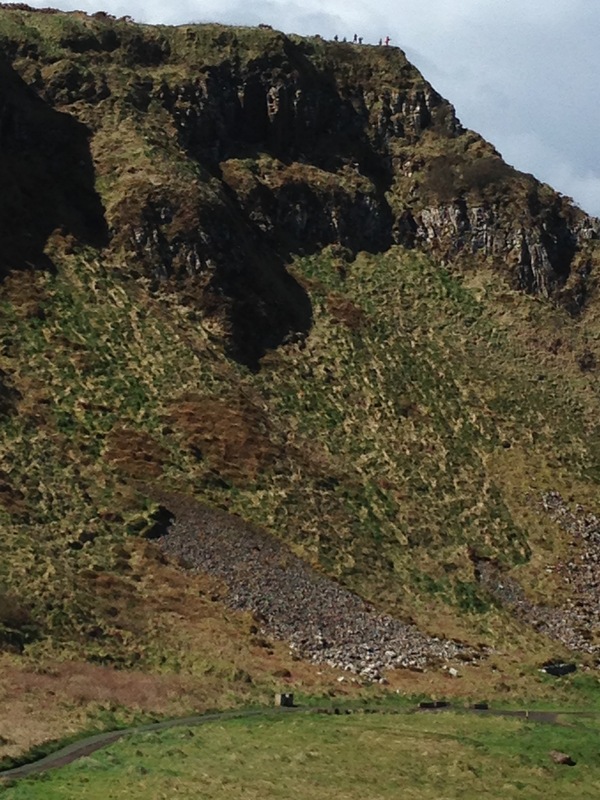 We enjoyed stops where the sheep were grazing on hillsides with a river below, and the very popular “Ladies view.” (see featured image at top of post) However our big goal for the day was to go to Portage to view Skellig Michael Island. In centuries past this was a place where Monks went to meditate and get away from the world. We had no idea what that goal would entail as we followed our GPS through narrow roads that morphed into what looked like bike paths and cars had to pull to one side to let the other one pass, and there were, by this time, some traffic and a lot of bikes. 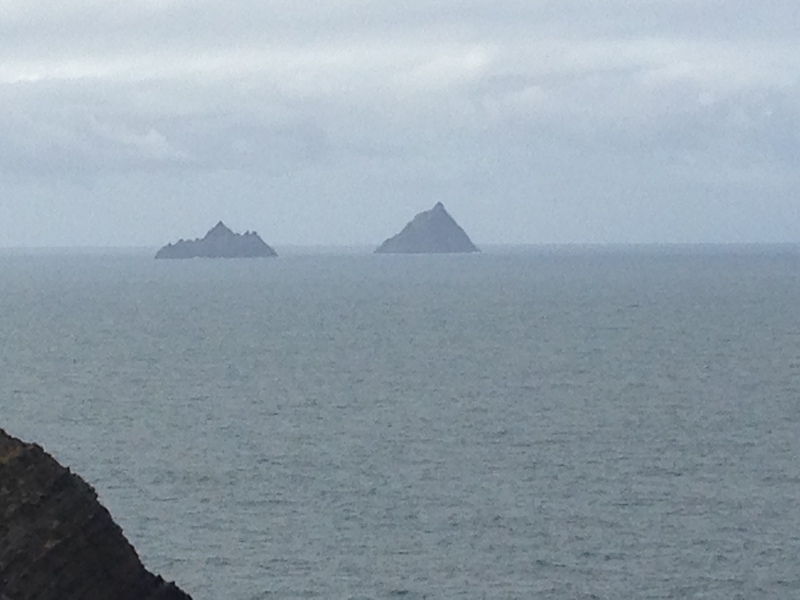 The draw to see Skellig Michael Island these days is that it is where the last “Star Wars” movie was filmed. 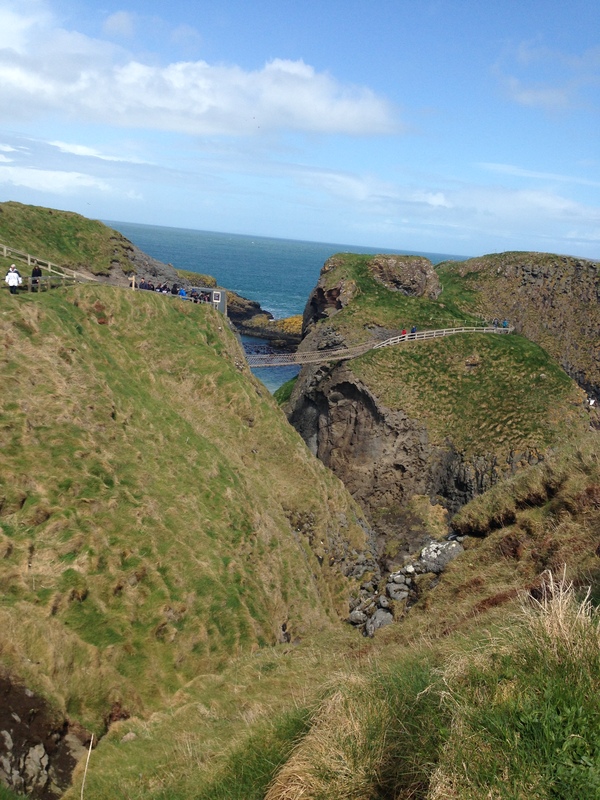 It’s a 5 hour boat ride from the coast, so viewing it from the cliff was our only option. 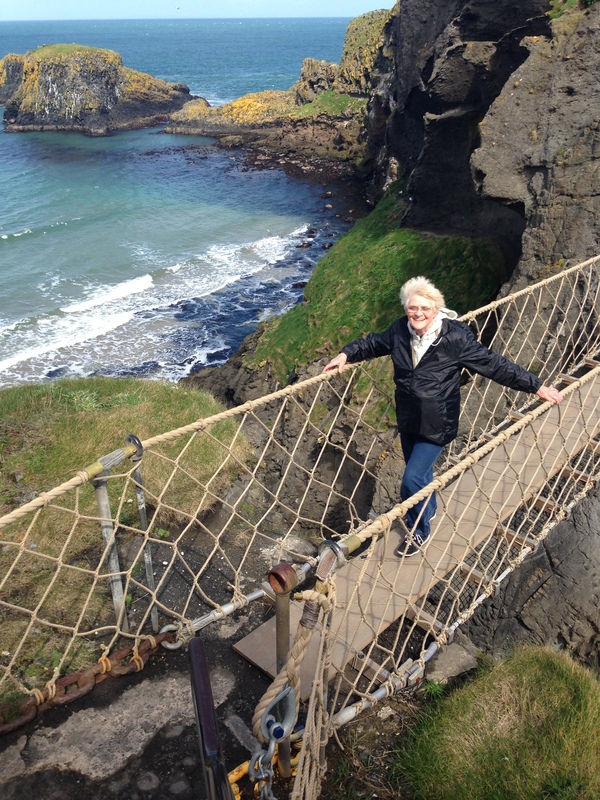 Who knew there was a cliff walk involved? The path is paved and very steep in some places, but all in all not a bad hike. 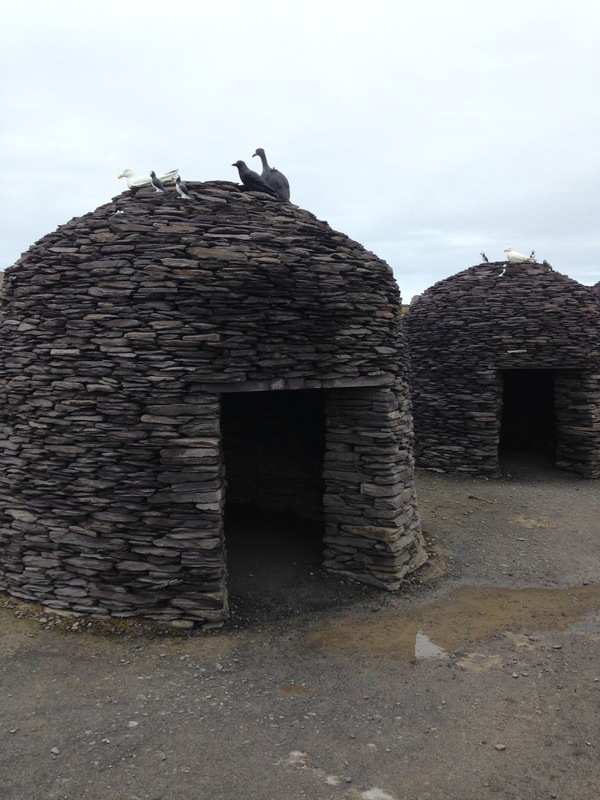 On the way up one of the three paths we climbed to view the islands, we were treated to these stone bee hive huts, with fake birds on the top. 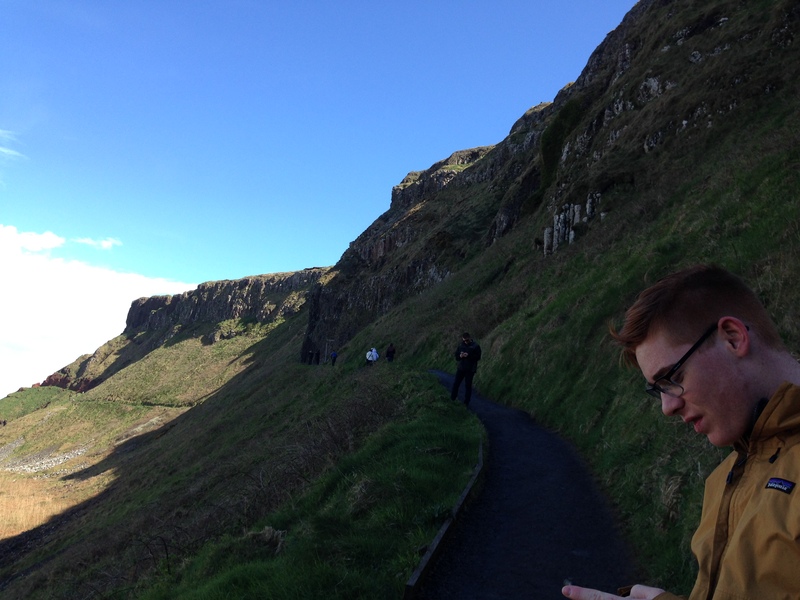 In case you don’t really believe we were climbing cliffs, I will include this picture. And the views down were also a treat. 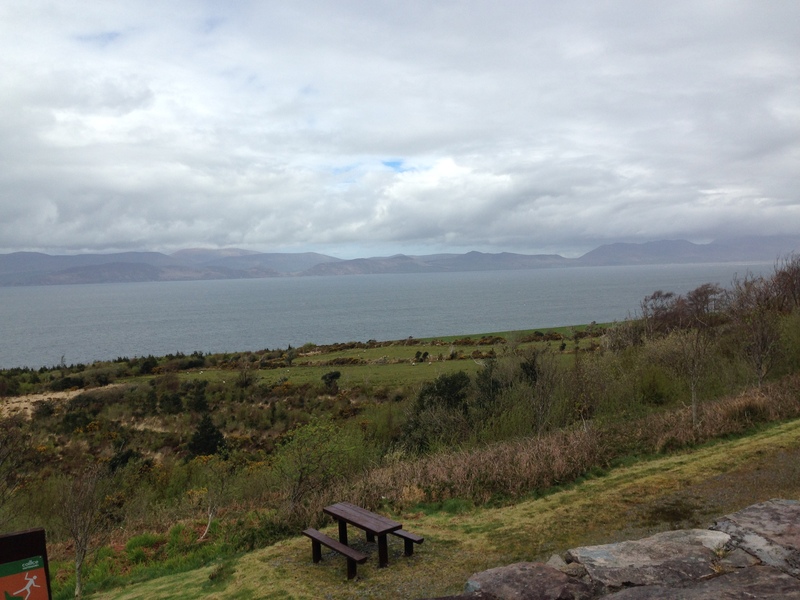 It was a chilly and windy day, the picnic table did not beckon us although the view was nice. 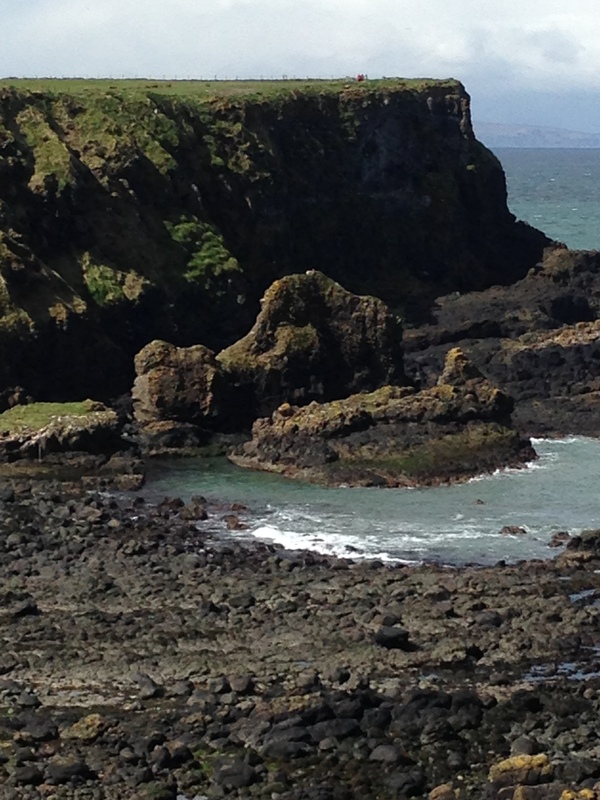 We viewed the Island from three different places, each one from a different cliff, from the third one we also saw Puffin Island, but no puffins. The day was also hazy and some rain. Did I mention chilly and windy? On the way down the third cliff we were caught in a wind draft that actually pushed us down the hill, just as we thought we might lose control it was over. It was a very exhilarating hike and the highlight of our day. Speaking of going down, one of our other unplanned adventures was cave walking. 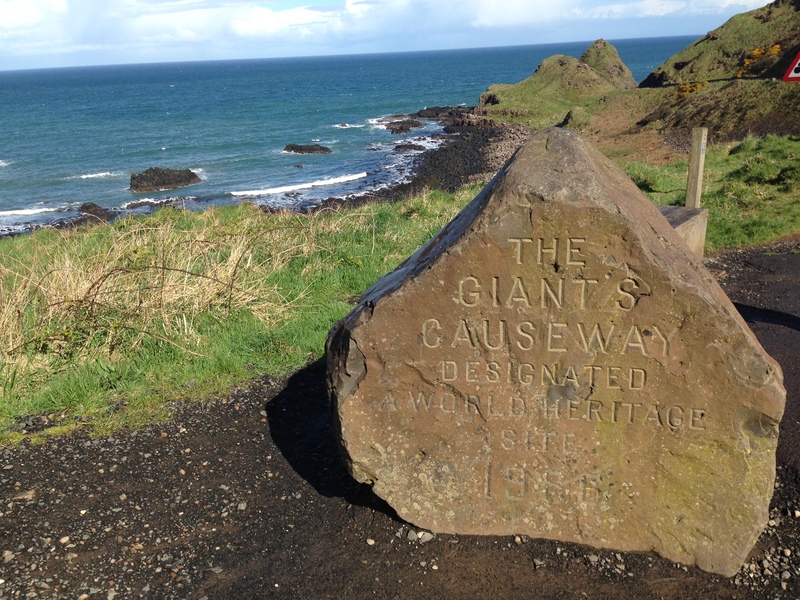 We found it one day by making a wrong turn. 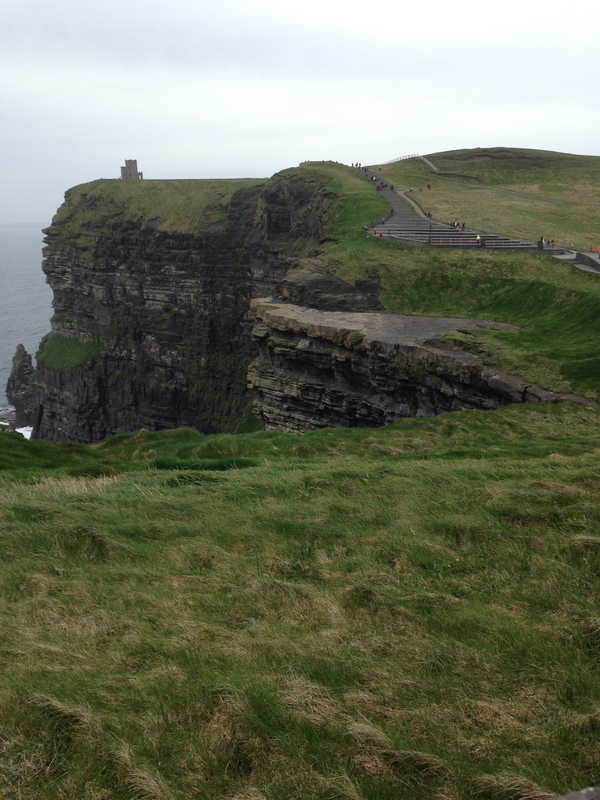 We were on our way to the cliffs of Moher on another rainy cool day. It was before lunch and who could be bothered by the rain in a cave? We began this hike by descending 125 metal stairs. 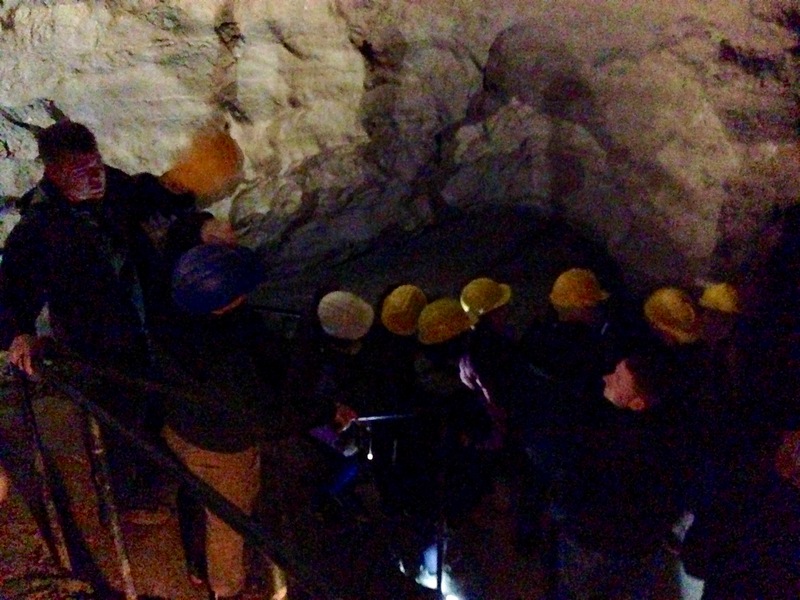 After that it was getting a helmet, walking through a low hanging tunnel, which was the reason for the helmets. I know for I bumped my head a couple of times. 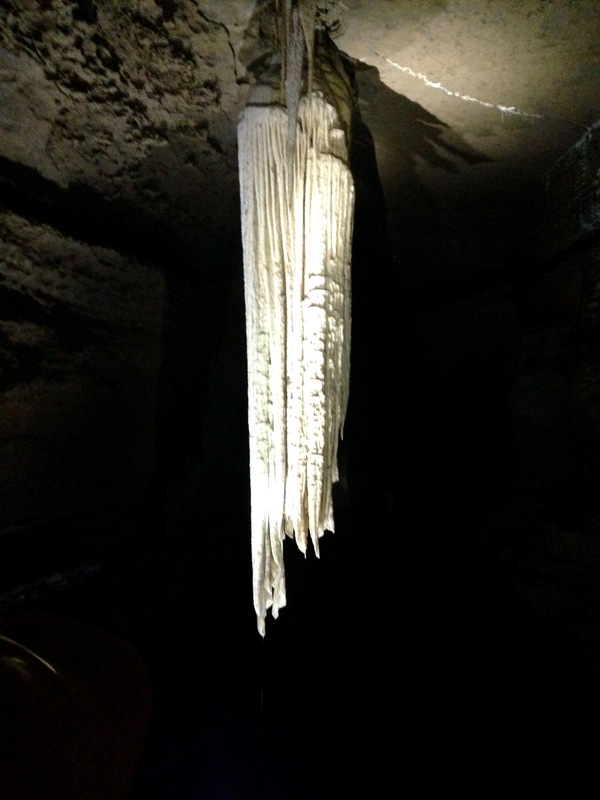 After the tunnel, it was down 90 more steps to see this magnificent stalactite, discovered in the 1950’s by two college students who crawled through the tunnel 250 feet below the surface and finally came into the opening. Today it is made much safer by the stairs. Did I mention what goes down must come up?? 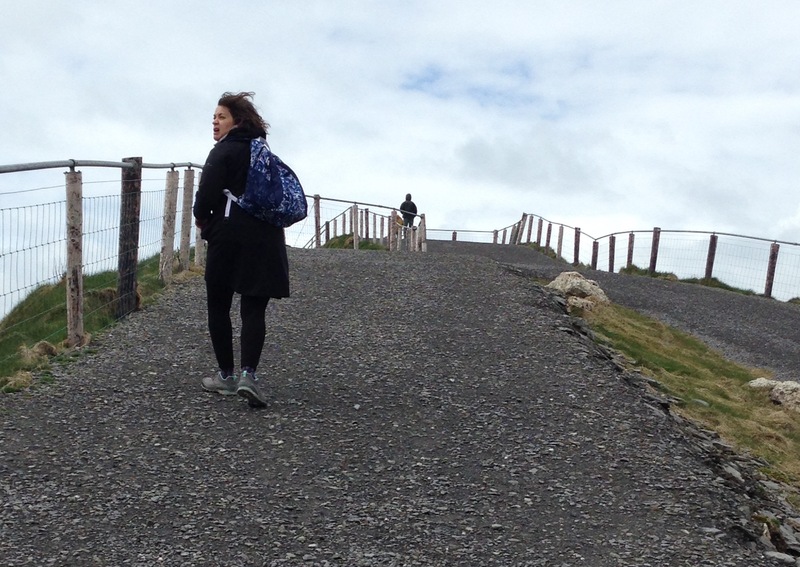 From there we head over to the cliffs of Moher. In my wildest dreams I thought surely you would drive to the top, park the car and get the view from the top. WRONG! 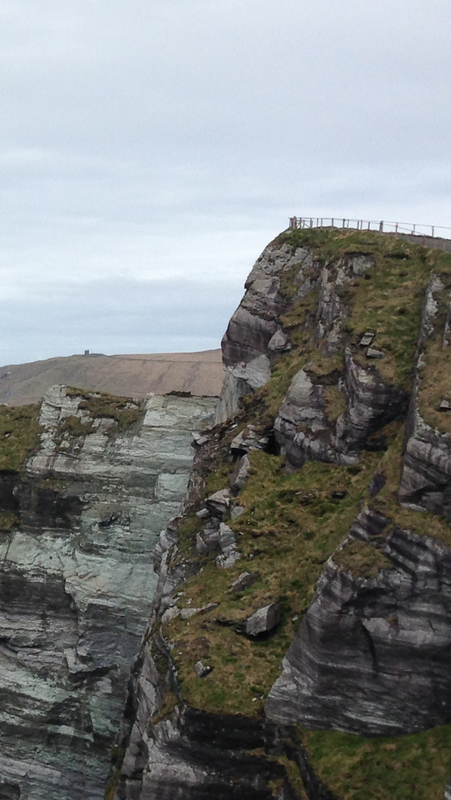 So very wrong, you park at the bottom and walk to the top of all six cliffs if you so desire. My desire ended after two. 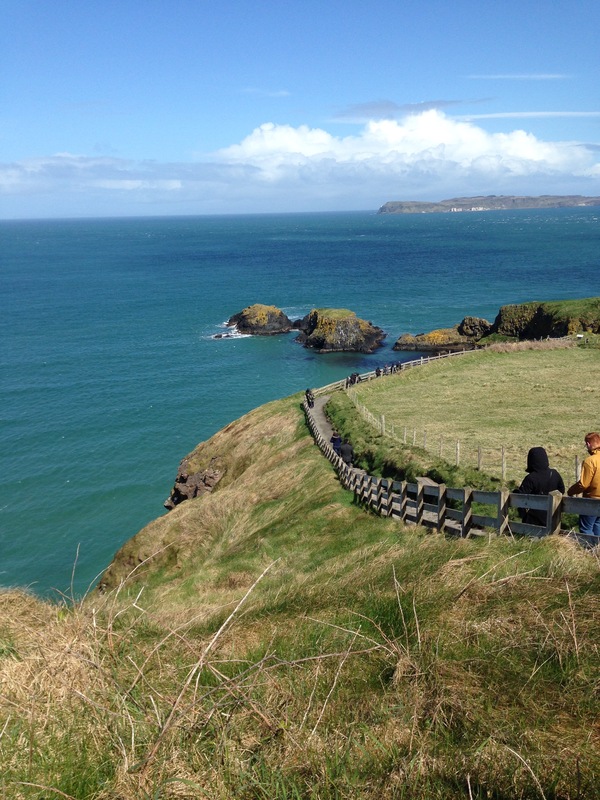 The view was great, but nearly the same from each cliff. 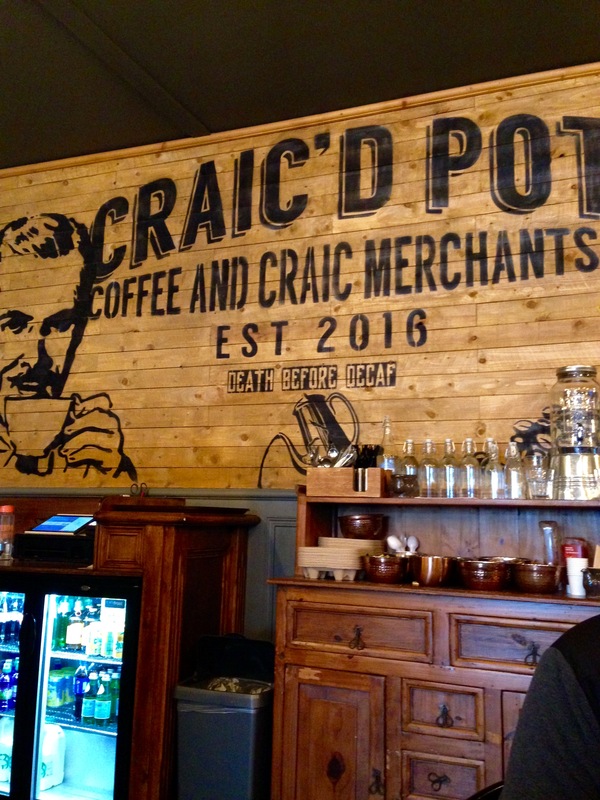 Finishing off this day in the town of Doolin was just what I needed, join me for the next blog “Toolin round Doolin” much easier than cliff and cave walking. Hope you enjoyed the hikes.